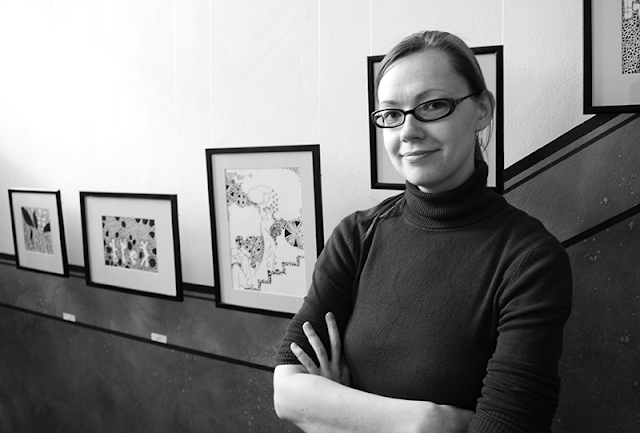 Siret Roots is an Estonian artist living in Tartu, active since the turn of the century and specializing in ink drawings and paintings. Since 2004, her works have been displayed at 16 solo exhibitions in Estonia and the UK, and she has also participated in several group exhibitions, such as the Southside Fringe in Glasgow and "Man and Woman" at the Viljandi Museum of New Art. Siret has provided illustrations for poetry books and websites and created the imagery for the Wales-based Celt Experience brewery's current craft beer range. A Tartu Art School graduate, she has also designed album sleeves and posters for a variety of Estonian, Finnish, British and American bands and artists. A selection of Siret's original works and prints is currently available from her Etsy online shop: http://siret.etsy.com. To order custom pieces, please contact the artist directly: siret.roots(at)gmail.com.